I've spotted another case of what appears to be gross plagiarism of work by an indie artist. Do please share with any illustrators and designers you know who post their work online. They might also like to check out the Zara website for work which shares an amazing similarity to their own. Below is the image featuring on the shoparttheft.com website page which highlights the various concerns. It invites designers to go to shoparttheft.tumblr.com to submit comparison photos and links so independent artists can be supported. I HAVE UPDATES: after speaking up about my art theft and @zara's bullying tactics, several other artists have come forward that @Zara has stolen from. 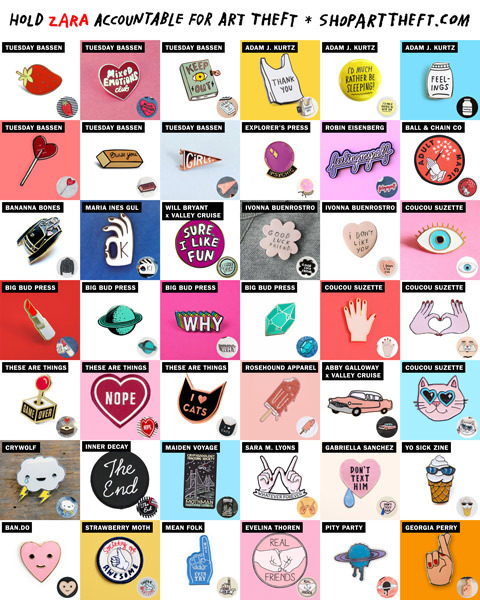 @ADAMJK is updating the list at @shoparttheft, but I will update you tomorrow with numbers of. Just. How. Much. Zara. Steals. From. Artists. .....and I'm pleased to highlight their concerns! Tuesday Bassen is an award-winning Illustrator and the force behind Shop Tuesday. She creates designs for pins and patches, clothing and home goods. She lives in Los Angeles. Clients include The New Yorker. Adam J. Kurtz is a Brooklyn-based artist and author whose first book, 1 Page at a Time: A Daily Creative Companion has been translated into fifteen languages. He says his design and illustration is rooted in honesty, humor and a little darkness. The prominent Belgian painter Luc Tuymans was found guilty of plagiarism by a Belgian Court in 2015. There are a number of examples of major artists thinking that the law on copyright does not apply to them. Tuymans is just one of them. This week I came across a different approach to copyright infringement on an artist's website. The message on the website didn't look to dissimilar to those you see on many websites with respect to who to contact if you want to reproduce the art. What was different was that the link went straight to a firm of lawyers in the USA who specialised in copyright and trademark infringement. Suddenly one knew that this particular artist meant business - in the literal sense. One that should be read by all art societies and organisers of art competitions awarding prizes to hyper-realistic paintings! AWS gold medal controversy - the final word - the final answer to the question of whether or not the artwork was a watercolour painting - or not! I think it's a very great shame that Mark E Mehaffey AWS doesn't get to include AWS 'Gold Medal Winner' in his resume. Are stories of copyright infringement as clear cut as they appear? This episode had two stages. Copyright for Artists - Congdon vs Cody Foster - First a designer accused a retailer of plagiarism. My post followed a mini viral storm about copyright infringement on the Internet generated by Lisa Congdon (Today is going to be awesome). Plagiarism comes up on a regular basis on this blog. Here are some key posts I've written. Plagiarism or 'passing off' - it's got to stop - this is a very long post which relates essentially to principles relating to plagiarism and derivatives. The post has been revised since first published for the reasons stated in the introduction to the revised post. The original post - and the revised version - were prompted by the daily painting movement and "Duane Derivatives". This post got a lot of visitors and an awful lot of comments. It includes definitions of both plagiarism and derivative art.It invites readers to have a discussion - with an educational intent - about what is and is not OK in relation to copying, plagiarism, imitation and derivative art. Make your own art! - This followed on from the above. It focuses on why original art is best and why every artist has it in them to be a complete original. If you don't want your artwork stolen..... - Artists can learn a lot about how to handle copyright issues from photographers. Why do people copy other people's images? How can you tell if somebody is copying? What should you do if you see somebody copying? 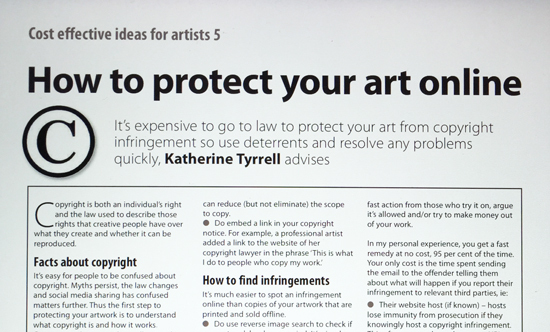 I recently had an article published in the June edition of The Artist magazine in the UK about How to protect your art online. I don't profess to be an expert however I have been following cases and looking for expert information and advice online for the last decade or so. Global Conventions on Copyright This includes links to authoritative national websites and various bodies dealing with copyright matters. These include advice on what what to do in your country if your copyright is infringed. How to complain about a copyright infringement on LinkedIn - and how to get it removed! Takedown: How Pinterest moved fast to remove my pinned images (#2) This is Part 2 of my post about remedies to the problem of images appearing on Pinterest without permission. Pinterest: How to prevent your Blogger images from being pinned - This post explains how to stop images on your Blogger blog from being pinned to aPinterest site - by inserting a meta tag in your Bloggertemplate. Pinterest revises TOS and addresses copyright issues: a Primer - The Pinterest team has decided to try and address the very real copyright concerns of visual artists, photographers and others. What you have done here for artists is magnificent! I'll pass it on to my readers. Thank you for helping artists to help themselves, accept their responsibility and defend their rights. Aletta de Wal, Artist Career Training.